Ben Spangler is a chef and traveler dedicated to creating dishes that are unpretentious and delicious. 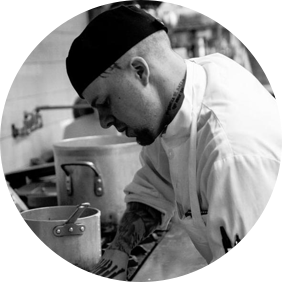 Ben has competed on national television for “Cutthroat Kitchen” and “King of Cones” for the Food Network and appeared on local Minneapolis food networks. His passion for travel led him to Mali, West Africa, in 2017, where he taught culinary students and restaurant owners in Bamako how to prepare healthy and satiating meals using inexpensive, farm-fresh ingredients from local farmers. He is currently at the Farm Table Restaurant, Amery, Wisconsin where he works to bring local farm produce and proteins direct to consumers offering a unique experience on each plate.